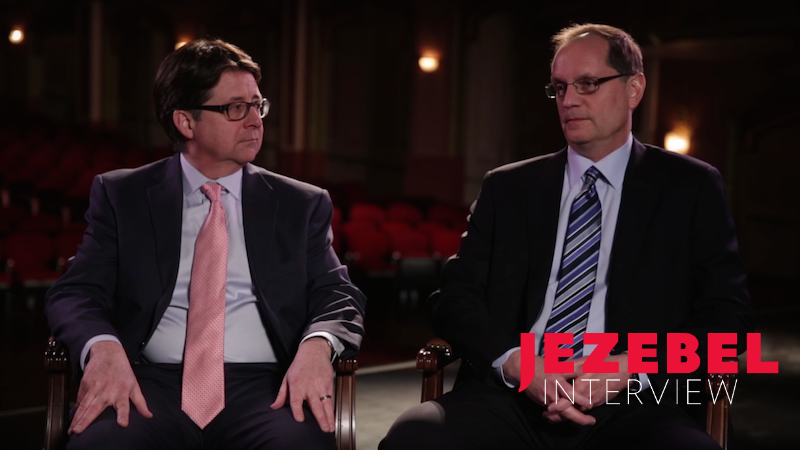 There is something uniquely odd about sitting in a theater of good-looking, affluent young people applauding the idea of increasing the number of well-trained, well-paid public defenders in the United States, but that’s what you’ll get at Dean Strang and Jerry Buting’s 20-city “Conversation on Justice” speaking tour. It’s the result of an unusual process of cultural dissemination: Netflix consumers binge Making a Murderer, become infatuated with its two primary justice seekers, spend money to be physically nearer to the nouveau celebrities, and, in the process, find themselves rooting for Strang and Buting’s cause: a fairer criminal justice system for the indigent and disenfranchised. Because of the unusual order of events, the questions posed to Strang and Buting are an uneasy mixture of serious questions about a legal process that systematically imprisons predominantly poor, black men and less serious marriage proposals to two middle-aged men who have spent their lives quietly fighting to change it. At New York City’s talk, which I attended Sunday evening at the Beacon Theater, the two expertly juggled the fangirl questions, the bizarre showboating moderator (music exec and criminal justice philanthropist Jason Flom who opened the show with a joke about giving head to a chicken), and the real, thoughtful questions about the ruined lives of Avery and Brendan Dassey and the system that did it. They ended the talk with some recommendations for ways to make change (demand mandatory video taping of interviews with suspects, vote for your state prosecutors especially in off years, donate to the Center on Wrongful Convictions of Youth and other charities). The arousingly-qualified lawyers seem to be capitalizing on their newfound fame as altruistically as they possibly could be. Both Buting and Strang have books coming out, in 2017 and 2018 respectively, and will donate a “significant” portion of the speaking tour’s ticket sales to “local and national equal justice charities.” And so the end product is something undeniably good. Jezebel spoke with the guys on Friday about life on the road, the effect of the true crime documentary wave on the families of victims and defendants, and Buting’s presidential ambitions. As they did with several of the questioners at Sunday’s talk (who were predominantly female), the two complimented the thoughtfulness of my questions. If anyone else had done the same, I might have been taken aback by the potential condescension. But when Strang and Buting did, I only became doubly devoted to them, their minds, their cause. How has the tour been going? What’s your expectation being on the road for the next couple of months together? Dean Strang: I think it’s been going great, honestly. We’ve had audiences that have been engaged in both the specific storylines in Making a Murderer and, more importantly, in broader questions of criminal justice. We’ve had really intelligent questions from audience members, because they get to submit them in writing when they come in, and we’ve had hundreds of questions: people taking the time in the lobby of a theater to write them out for us. Jerry Buting: And a lot of different ones. I mean, you do hear some of the same ones, but every night we’ve also had new questions that we haven’t seen before, questions with a little bit of a different spin. It’s been very encouraging for both of us. DS: You see people actually clapping and rooting for a fairer system of criminal justice, for less racial disparity in our system, for less impact on the poor, for improved funding of indigent defense and prosecutors offices. And just personally, I really enjoy spending time with Jerry Buting. Seriously, this has been one of the best things about it—to have a friend who’s traveling with you and on stage with you, who’s got more patience, for example, for media interviews than I do. We complement one another. JB: Yeah, we complement each other’s strengths and weaknesses as need be. I’m not always more patient. Today I think I am. I’m sure as it goes on your dynamic will evolve. JB: As somebody put it, we got the band back together after 10 years. DS: [laughing] That’s not always good! Some bands probably shouldn’t go back on tour. Does this specific tour have anything to do with the second season? Do you have any involvement in that? JB: No. Not at all. DS: We haven’t even been told that there is a second season, that anybody’s thinking about that. I’ve read that online. JB: We don’t have any inside information on that. DS: I mean, there’d be no role for us on a second season. We don’t represent Steven Avery anymore. Have you been following the election? Is that something you want to weigh in on? JB: We don’t want to take a side for a particular candidate or party because we don’t really think that the issues that this country faces about criminal justice are or should be part of it. One thing that we can say is that, for the first time in our lives, we’ve actually heard criminal justice reform mentioned as an issue—as a topic at presidential debates, and on both sides. That’s encouraging. But I don’t want to politicize what we’re doing. DS: And I agree with everything Jerry said, although I can give you an exclusive. If he’s asked to step in at either of the major parties’ conventions this summer, yes, Jerry Buting would be a candidate for president of the United States. JB: He hasn’t cleared that with my people yet. Are you going to step up to your patriotic duty? JB: I’ve had people ask me that on Twitter, believe it or not. Or for Scalia’s seat on the Supreme Court. But I’m not a candidate for either, I’m afraid. DS: If called upon, Jerry will always serve. More broadly, do you have opinions about which candidates might be good or bad for the particular kind of criminal justice reform that you have been talking about? DS: Actually, I really do think that a broad spectrum—cutting across both the Republican and the Democratic parties, and other public office holders—are at least talking about the right issues now. Whether that’s Rand Paul or Bernie Sanders, Hillary Clinton or Ted Cruz, you are hearing some interest in striking a new balance on individual liberty, on privacy. Maybe some rethinking of the liberty and privacy we’ve given up in the years after September 11th. Also you’re hearing some fiscal sense for the first time from both major political parties and most candidates within them, on getting smart on punishment, and not ruining people’s lives forever over minor drug offenses, and simply not any longer mindlessly incurring both the fiscal and the social costs of unreasonably long prison terms and mandatory minimum sentences that remove common sense from the sentencing process. JB: In Wisconsin, for instance, the pendulum started to swing a little bit back when people woke up and realized that suddenly we are spending more on the Department of Corrections than we are, statewide, on UW—on our university system. People said, wait a minute: what’s wrong with this picture here? DS:And that’s happening in many states around the country where the corrections budget now exceeds the state university budget. We’re spending more tax dollars to lock people away and destroy their opportunities than to invest in their opportunities for a better future. And I think people are beginning to question that, whether they’re Republicans or Democrats or independents. I think that in part a lot of the interest specifically in criminal justice reform has been because of the rise in popularity of these kinds of shows, like Making a Murderer, that shine a light on local criminal justice systems—obviously that’s been written about a lot. Something that hasn’t been touched on as much is how this true crime documentary trend is affecting the families of the people involved—the actual people not just the issues. What are we to do about that? DS: I think that true crime presentations, whether in film or podcast or published in the print media, exact a real toll on a victim’s family, on a defendant’s family, on the people who love and support either the victim or the defendant in a criminal case. There’s no question that those individual people bear a real increased burden of intrusion and just emotional weight from any true crime depiction. And what justifies that—when it’s justified—is that the true crime depiction is thoughtful, that it raises broader questions that are of overriding public interest. Public good can come in the long run, if only in a diffuse way, out of a tragedy. We often don’t look for good outside a very general sense: there can be good in a compelling, thoughtful, intelligent true crime depiction, like Serial, like the movies about the West Memphis Three, or the documentary about Alaskan natives who were wrongly convicted in Fairbanks. That overriding public good, of drawing attention to problems and having a chance to improve the operation of criminal justice in the future for defendants and victims’ families, I think, makes this worthy. But there is no question that specific people carry a peculiar and distinct burden of this social good. And that’s true of a lot of public goods. You go to war, you hope it’s for good reasons. You hope in the end that it leads to a better world. But the folks that went off and fought in that war, even if they come back alive and in one piece, still have borne a really distinct and very heavy burden. Did you guys watch The People v. O.J.? JB: Unfortunately not, we’ve been a little bit too busy. I hope to catch up on it at some point. DS: I saw bits and pieces of the original trial... There’s more than one O.J. thing out now, isn’t there? DS: Thank you so much, these were really thoughtful questions. JB: Yeah, they weren’t all repeats of what we’ve heard before. JB: You put some thought into it. DS: And you got a scoop, Buting 2016. I know I’m so excited about that. Thank you, Jerry, for agreeing to run! JB: Well, I am a servant.